The first X-Men Prime was released in May of 1995, on the heels of possibly the best-received crossover in franchise history, the Age Of Apocalypse. That story was so well received that it became a problem for the books themselves, caught slightly off-guard by the runaway success of the alternate universe crossover. As such, the return to basics offered by that X-Men Prime proved problematic. The attempt to replicate the success of the Age Of Apocalypse without a good plan led to Onslaught—the inevitable outcome of trying to write an event around a cool name. The second X-Men Prime #1 arrives under opposite circumstances. The recently concluded Inhumans Vs. X-Men put a capstone on one of the worst-received directions in franchise history. Years of diminishing returns and underwhelming editorially dictated directions have emaciated what was once, and for a very long time, comics’ dominant franchise. It’s difficult to imagine a more necessary candidate for a back-to-basics reboot than Marvel’s mutants. There’s no good reason why the franchise can’t still be interesting. It’s not as if horny young adults fighting each other with superpowers is a particularly unpopular genre. 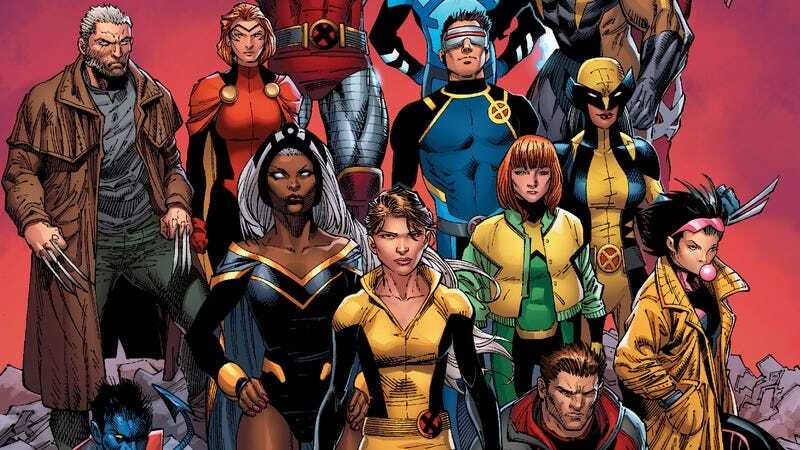 The problem for the X-Men, however, is similar to the same problem that faces a number of Marvel’s other marquee franchises: There’s just nothing there right now, and nothing that seems to be sticking with anyone. X-Men Prime does seem to have been conceived with the purpose of addressing this deficit head-on. The plot, such as it is, is built around the return of a missing cast member. The return isn’t a spoiler—Kitty Pryde, front and center on the cover, is left with the responsibility of having to justify the existence of the team after the general acknowledgement that the core cast has been put through the wringer and they aren’t feeling very fresh. It’s a tall order for writers Marc Guggenheim, Greg Pak, and Cullen Bunn, essentially an issue-length tour through all the ways the franchise lost its way in recent years. Four artists—Ken Lashley, Ibraim Roberson, Leonard Kirk, and Guillermo Ortego—can’t help but give the book a generic appeal. To be fair, it’s a talking heads book that walks the reader through the last few years of continuity while setting the stage for the next round of stories, which is a tough gig under the best of circumstances. There’s a lot of water under the bridge for these characters since the last back-to-basics reboot, however many years ago. The book is filled with reminders of all the weird, tiny (and a few not-so-tiny) changes accrued over multiple decades until the team was left looking, essentially, like strangers in their own book. Without actually pressing a hard reformat, any reboot has to explain that some changes are here to stay—Jubilee is a mom now, the original five X-Men have still not returned to their original timelines—while still managing the trick of slamming everything else back into (supposed) optimum configuration with a minimum of fuss. In the case of X-Men Prime, the series accomplishes this slamming with a surprising degree of imagination and simplicity. The final page promises a new status quo for the franchise that actually does something the X-Men have never tried before. It could amount to nothing. It could be a breath of fresh air. Unfortunately, it wouldn’t be the first time in recent months and years that a promising idea has been put out to die prematurely. For the last two years, Spider-Woman has been one of Marvel’s most consistently entertaining, fun-loving titles. Dennis Hopeless’ two-volume run on the series began with a lackluster tie-in to the “Spider-Verse” event, but the book underwent a dramatic transformation thanks to a new art team and status quo. Penciller-colorist Javier Rodriguez and inker Alvaro Lopez joined Hopeless to put Jessica Drew back on the P.I. beat (with a slick new costume from Kris Anka), and the addition of reformed supervillain Roger “The Porcupine” Gocking and Ben Urich to the book’s supporting cast gave Spider-Woman a fresh group dynamic to explore. The post-Secret Wars relaunch brought a big change with Jess’ pregnancy, and the last year has focused on Jess’ adventures as a single mother superhero and her developing romantic relationship with Roger, a single parent himself. Spider-Woman #17 (Marvel) wraps up the series by calling back to the past while introducing a new challenge for Jessica’s future: Her son, Gerry, has superpowers. This second volume started with a superhero rooftop party celebrating Jess’ pregnancy, and Jess is throwing another shindig to introduce her friends to Roger, who is officially her boyfriend after an exhilarating, twisting arc pitting the couple against The Hobgoblin. Jess and Roger have a sweet, tender relationship that has evolved naturally over the course of the second volume, and in a superhero climate that undervalues romantic plots, it’s refreshing to have a book, like Spider-Woman, that puts a lot of work into establishing a believable couple that the reader wants to root for. The superhero community has some very different opinions on Jess dating a reformed D-list supervillain; Spider-Man thinks it’s great that Jess is taking an active role in Roger’s rehabilitation, while Black Widow is very vocal about her disapproval of Jess squandering her big-league potential by “playing P.I. in the dirt” while training and dating a buffoon. Hopeless’ run on Spider-Woman really took off when he started focusing on how relatable everyday problems are complicated by a superhero lifestyle. Changing career paths, having and raising a baby, falling in love and introducing your new partner to your friends—these things all become more dramatic when compounded by aliens, supervillains, and superhero civil wars. On that note, Carol “Captain Marvel” Danvers has been written better in Spider-Woman than anywhere else in the Marvel Universe over her unfortunate Civil War II year, and her friendship with Jess has been a major part of the second volume. Friendship and love are at the core of this series, and this final issue is all about those two elements. Jess has a boyfriend that deeply cares about her and her son, and Carol and Ben have been invaluable friends during overwhelmingly stressful times. The series ends by showing that a hero has a more fulfilling, happy life when she’s surrounded by friends, and it spotlights the value of developing a strong supporting cast in a solo superhero title. Rodriguez and Lopez left Spider-Woman to create some truly breathtaking visuals on Doctor Strange And The Sorcerers Supreme, but Jess’ exploits never stopped looking spectacular as Veronica Fish took over as artist. I wrote about Fish’s breakout year in the Comics Panel review of Slam #1, and her art on Spider-Woman is inventive, exciting, and full of emotion. Jess and Roger coming together was all the more heartfelt because Fish has a talent for capturing the affection between characters, and the romantic leads of this book are adorable around each other. Fish’s action storytelling is also remarkable, and she brings a frenetic energy to the revelation of baby Gerry’s superpowers in this issue. The two-page spread of Gerry bouncing around Jess’ apartment while Roger tries to grab him is exquisitely composed with a top-down angle that creates a strong sense of place while highlighting Gerry’s enhanced mobility. And when Gerry makes his way to the party upstairs, Fish brings out the comedic side of superhero action as everyone tries to subdue the slippery infant. Rachelle Rosenberg has colored the majority of this second volume, and she’s created the richest visuals of her career, drawing inspiration from Rodriguez’s vibrant palette and lush rendering style to elevate her own work. She embraces pastels in this final issue to reinforce a cheerful, optimistic atmosphere, and she makes Fish’s linework even more beautiful by pairing it with the bold colors of sunset. Javier Rodriguez has stayed on as cover artist, and Spider-Woman #17 is a rare sequential cover that remarkably captures the warmth and joy that have made this book such a delight. Driving a convertible with Ben, Roger, and Gerry as passengers, Jess looks at them and smiles, content with her life as they head toward unknown adventures down the road. Emma Ríos and Hwei Lim’s first creative endeavor wrapped with Mirror #5 eight months ago, a short run that was visually stunning and emotionally stirring with memorable, singular characters. With Mirror #6 (Image), they start up a new arc, in a universe that appears to be related to the first. Readers don’t need to read the first five issues (though they certainly should) to understand the new plot. While Lim did most of the art for the previous issues, Ríos takes up drawing duties for #6, bathing the pages in sharp, graceful lines and deep blue-green watercolors. The cast of characters and the world that they’ve built for this new story is just as in-depth and interesting as the first one, but it focuses more on individuals. Ninua is a headstrong and driven young women, apprenticed to stone carver Zita. Zita is often employed by mysterious Elders to restore carvings and buildings in an interdimensional space where only they can survive. It’s wise to read the interior of the front cover to get a bit of background, but the story itself reveals these details as it unfolds. Switching up art responsibilities makes the distinction between the two stories all the easier to accept. Lim’s style was very well suited to the animals that populated most of the first five issues, but Ríos’ skill with layering borderless panels and filling pages with dizzying arrays of literal and figurative sights is a much better fit for a journey into a liminal space like the one Ninua and Zita take. Where Ríos’ Pretty Deadly is drenched in reds and purples and browns, she shifts her palette to gold and a lot of soft blue; it gives her a chance to display her skill with grand scale and architecture, something that many of her other projects haven’t allowed. The first story arc in Mirror was nuanced and difficult, with conflicting needs and moral quagmires at war with sympathy. This one has already proven to be no different. Ninua’s stubbornness and Zita’s affection for her apprentice put them in a perilous position, both physically and with Zita’s strange patrons. The danger is immediate enough to feel like a very real threat. It’s not common to see older women in comics, particularly ones like Zita: She’s square and physically strong and brusque, with a strange sense of humor that really only appears to appeal to those who already like her. The relationship between Zita and Ninua is equally rare—not quite maternal or familiar, but a friendship and companionship based on a shared passion, a mentor guiding the next generation into her profession. Mirror #6 was always going to be visually stunning, as both Lim and Ríos are some of the best when it comes to painterly watercolor comics with astonishing detail and grace. But it also continues the trend from the first five issues, offering no easy answers and framing the story around interesting characters that draw attention and affection at once. It’ll be fascinating to see where this new story goes, and how it fits into the first one, if at all. In the words of Sticks Angelica, “It’s tough, kind of, living your entire life with the absolute certainty that you’re better than everyone else.” A sort of jack-of-all-trades, Sticks spends her life in the Canadian wilderness with her rabbit friend, Oatmeal, and various other animals, trying to order the wilderness to her will—much to its chagrin. She is the subject of Michael DeForge’s latest, Sticks Angelica, Folk Hero (Drawn & Quarterly). Originally published as a weekly webcomic, the book takes the form of a daily comic strip—the pages themselves resemble a strip, with its landscape format, logo placement, and the fact that each installment is largely self-contained. And following in the well-worn footsteps of strips like Calvin And Hobbes, it traces the daily goings-on of its title character and her growing cast of friends and acquaintances. Like all of DeForge’s comics, Sticks Angelica features a striking and singular aesthetic. He contrasts a sickly pink against black and white opacities, making each chunk of color pop, creating a nightmarish tableau. DeForge’s lines remain difficult to describe, because of their seemingly paradoxical blend of simplicity and complexity. His individual panels feature positively spartan designs, where the panel is reduced to a very simple composition and each object is reduced to an abstract form. Those forms marry the geometric to the organic, with squiggly shapes overlapping perfect spheres, and their convergence produces things both adorable and grotesque. Knowing when to deliver one and when to deliver the other is one of DeForge’s strengths, and his comics have always been a joy to read for the sheer irreproducibility of his visual style. And yet, what most impresses about Sticks Angelica is the ways it evinces DeForge’s maturity as a writer and cartoonist. The series begins as an intimate affair with a small cast of characters and simple, straightforward scenarios. But as the book progresses, the cast grows to include DeForge himself and a moose named after cartoonist and BoJack Horseman production designer Lisa Hanawalt. Characters, ideas, and seeds for future stories are introduced and left to flourish on the margins and in the background, and as the story careens toward its end, arcs become longer and more involved. The multivaried and complex rules of rural Canadian life are explored, and DeForge is careful to give every aspect of his world a rich and barely seen history. He provides even his most minute characters with a compelling interior life. While most of DeForge’s work has gravitated toward the shorter side, like his earlier Ant Colony, Sticks Angelica demonstrates his ability to juggle multiple threads, to slowly build out characters, stories, and spaces, and tell a coherent and contiguous cycle of stories. Much of DeForge’s work is excellent, but the particular charms of Sticks Angelica, Folk Hero make it one of his most endearing to date. Its long-form storytelling with a comic strip structure allows it to be read in one breathless sitting or at a more leisurely pace. And, while its comforting embrace compels one to consume it at once, a more careful, studied read proves rewarding, making Sticks Angelica a powerful addition to DeForge’s oeuvre and one of the year’s best releases so far.